Just a block away from the busy harbor of Reykjavik lies a little stand in a modest parking area, next to a taxi stand. If you’re ever in Reykjavik, you can’t really miss the place. Between its opening at 11am, and whenever it closes (sometime after bar closing), this stand, Bæjarins Beztu Pylsur, has at least a modest line of people queued up waiting to order, and the line moves quickly. Doing a little bit of research, I also found that Bæjarins Beztu Pylsur is actually (by number of annual visitors) the busiest restaurant in Iceland, and that the vast majority of Icelanders, and a good fraction of tourists, have eaten here. Bæjarins Beztu Pylsur is a hot dog stand. The name actually translates to “The best hot dog in town”. And judging from the lines, the name is probably accurate: I saw at least a thousand hot dogs served up from this little stand during my visit here. 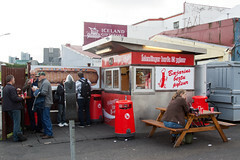 Really, this is a symptom of another thing I discovered on this trip to Iceland: Icelanders love their hot dogs. Once you get outside of the general Reykjavik area (which holds approximately 2/3 of the country’s population), you quickly discovered that Iceland is very sparsely populated, and that even basic things like grocery stores and restaurants become few and far between. But there’s one thing you can count on in Iceland: if there is food of any type to be had at a location, it’s likely to include hot dogs. We had hot dogs in Reykjavik. There were hot dog carts on the central market street in Akureyri. We even found hot dog carts on the edges of steaming lava fields and the base of waterfalls. And most every staffed N1 Petrol Station in the country also serves hot dogs (don’t worry, I’ll probably come back and review each of these). And it’s not just any old hot dog they are serving up… they serve up their Pylsurs (hot dogs) Iceland style. 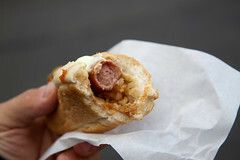 What makes an Icelandic hot dog? First of all, the hot dog itself is a different dog: in addition to the usual pork and beef random cuts of meat, the primary meat of a good Icelandic Pylsur is, unsurprisingly, lamb (considering it’s almost impossible to take a rural photograph of Iceland without at least one sheep making its way into the frame, this isn’t surprising). It makes for a surprisingly flavorful and robust hot dog, actually. The second thing that makes it special is the condiments. If you order one with the standard toppings (“eina með öllu”, one with everything), you get a hot dog with ketchup (Who puts ketchup on a hot dog? Icelanders, that’s who! ), sweet mustard, Danish-style remoulade (basically mayo with bits of pickle and carrot in it), raw onions, and crispy fried onions (the last of these resembling finely minced Durkee fried onions). It’s not a completely novel concept, since long-time readers may remember our review of Annie’s Kiosk in Denmark that serves up a very similar hot dog, but it’s definitely the way these things get served in Iceland. And it’s a really good combination of condiments, especially the crunch from the fried onions. I almost had to buy some to bring home with me. And Bæjarins Beztu Pylsur is obviously the place to get them in downtown Reyjavik, since this place is always busy, and doubly-so at night with the bar crowd. But they run a good operation: you walk up, order your dogs with toppings, and whether you want a beverage (that’s it, there’s nothing on the menu except hot dogs for 320 ISK, and soda for 180 ISK), and the guy assembles your hot dog promptly using the preferred Icelandic order of condiments: Fried onions go in first. Followed by raw onions. Followed by ketchup. Then the hot dog. Finally, the mustard and remoulade. You take your dogs, and you either consume them standing up at the counter, or at one of the nearby tables, all of which have little wooden racks designed to hold your pylsur without it toppling over and suffering a LOCA (Loss of Condiment Accident). In any case, it’s a really good hot dog. 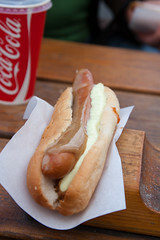 In fact, the best I had in Iceland, although all of the Icelandic hot dogs I had were good. Between that and the location, it’s definitely got some success under its belt. Is ketchup on a hot dog actually considered odd? Growing up in Kansas City, it was always fairly standard; most people I knew went with ketchup, mustard and (possibly) relish. That same trio also composes the contestants in the condiment race at every Royals baseball game.